If you’re looking for a night where Moms can make memories, while getting crafty with sangria and tapas…try My Social Spa. The new girls night out in Tampa is located near you at Boca in Riverview. This trendy and fresh restaurant/bar located in Winthrop Center, offers exclusive $5 drinks and $7 tapas at our events. So you can eat and drink while you craft fresh spa products led by a Sparista. No experience required, just fun moms and your favorite drink. We provide all ingredients and take home containers. You can borrow one of our aprons to keep you looking cute and clean! 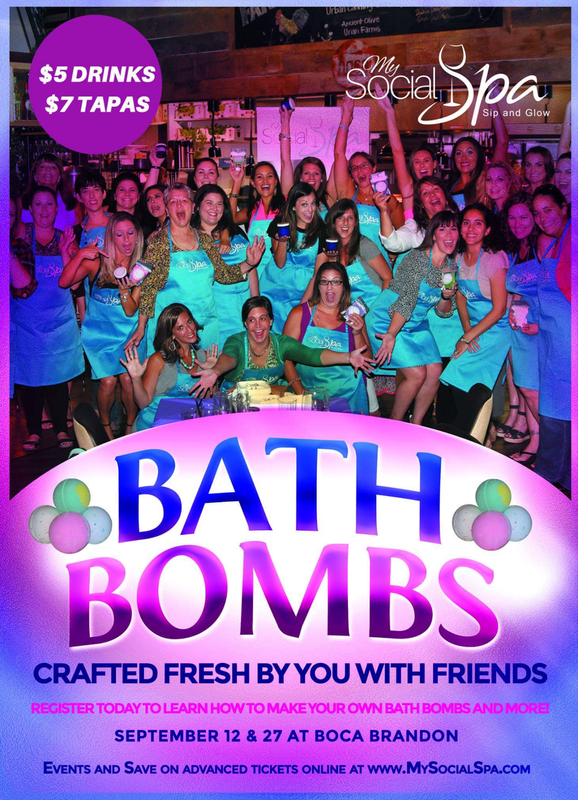 September is Bath Bomb Month, so our 2 classes on Sept. 12 or 27th will be crafting fresh bath bombs. Group nights are simple. We will provide you a registration link, everyone purchases their own ticket, and done! Just show up and have fun. and receive $5 off when you register! It’s easy..
4. Enter registration information & done! An email will be sent with your ticket and confirmation. We are currently running an Advanced ticket sale of $29.95, so with your code – that gets you a ticket for $24.95! But hurry, its for a limited time and our classes do sell out. Our regular ticket price is $39.95 and you can use your code towards that once our Advanced Ticket Sale ends.